A new offering from DW, this Heavy Bell Bronze Snare puts out 20 pounds worth of tone and projection. Also available in 5.5x14. Payments as low as $72/mo. Drummers seeking powerful cut and rich bronze tone should look no further than this heavyweight from DW. Weighing in at 20 pounds, this drum sports a rolled bronze shell which offers plenty of full-bodied tone with a fast attack. Even when cranked to higher tensions, this drum still exhibits plenty of body and punch. A sensitive touch brings out the complexities of the bronze, while powerful rimshots will crack and cut through any wall of amps. This snare drum is an absolute monster! 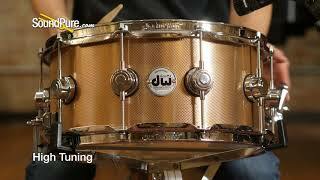 In this video, Sound Pure drums specialist Barry Knain explains the various features of the DW 6.5x14 Collectors Heavy Bell Bronze Snare Drum with a Knurled bronze plated finish and tests it out in several different tuning ranges. Bell Bronze is one of the physically heaviest snare drums we offer and provides a volume and projection that is seldom matched. The rolled shell is available in a knurled natural bronze finish and can be customized in any of five available drum hardware color options. This drum is perfectly suited for most rock and metal situations.